By Ryan Whitwam on Nov. 12, 2012 at 11 a.m.
Scanning, Star Wars, and pixels. 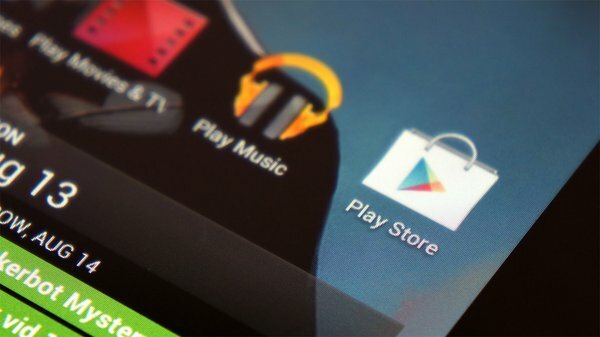 It's easy for some of the best apps in Google Play to fall through the cracks, especially now that there are hundreds of thousands of apps available. With the weekly Google Play App Roundup, we try to bring you some of the best new, and newly updated apps on the platform. Just click the app name to head right to the Play Store page. This week your camera gets all business-oriented, Angry Birds gets a new lease on life, and pixels get big. If you’ve ever taken a picture of a document to save it for later, you’ve probably wished you could just make it into an easier to use PDF. That’s what Scan Master is for, and it actually functions very well. It’s also free, so it’s hard to argue with. The interface is good-looking in Scan Master, though not really in-line with the Android Holo UI. Your main functions are presented as buttons down the left side of the screen. The one you’ll use the most is (obviously) the top camera option. Tap that one, and you’ll get a viewfinder where you can line up the shot of your document, whiteboard, or whatever. There are two ways to grab multiple pages for a single file, and this is the only area where I felt a little confused by Scan Master. If you want to edit the images for better readability, snap the first image then tap the checkmark button at the bottom. 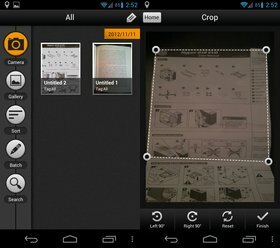 You will get the cropping interface to clean up the borders and the editing interface to tweak the brightness and contrast. The app will have a camera button beneath the preview of your final page so you can circle back and add a second in the same fashion. If you don’t want to edit pages, just snap multiple photos before hitting the checkmark. I quite like that the cropping interface picks up edges fairly well on its own. It’s even better that it gives you a small picture-in-picture view of the corner as you’re moving it. You can’t see through your finger, after all. Each PDF you save will be listed on the main page of the app. You have the option to sort by name, date created, date modified, or tags. The app defaults to having tags for things like documents and bills. But you can add whatever you like. If you need to track expenses for your job, you could make a tag for it and use batch processing to share them via email to your employer. I would say that image quality in Scan Master is good, but not great. I’m testing this app with the Galaxy Nexus, which has a famously mediocre camera. Though, I feel like it’s still not quite performing up to its maximum. You should give Scan Master a shot if you need to save any docs for later. Well, there sure has been a lot of Star Wars news as of late. 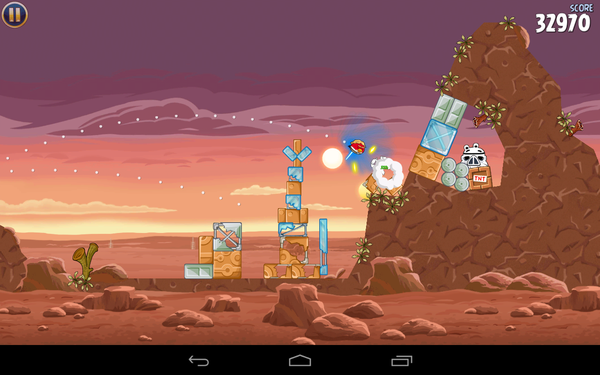 Perhaps just as divisive as the purchase of Lucasfilm by Disney, is the new alliance of Star Wars and Angry Birds. you might feel like Angry Birds has run its course, but I’ll say upfront that Angry Birds Star Wars is working out much better than I ever thought it would. If you’ve played an Angry Birds game before, you probably think you know what to expect, but you’re only half right. Sure, you’re going to be killing pigs and knocking down structures. The birds, though, are totally new and modeled after your favorite Star Wars characters. What’s more, the special abilities are all new: a Luke Skywalker bird that swings a lightsaber, an Obi-wan bird with force throw powers, a Han Solo bird with a blaster, and more. Yes, it is as awesome as it sounds. The story in the old Angry Birds games had something to do with eggs. It didn’t matter in the context of the gameplay. 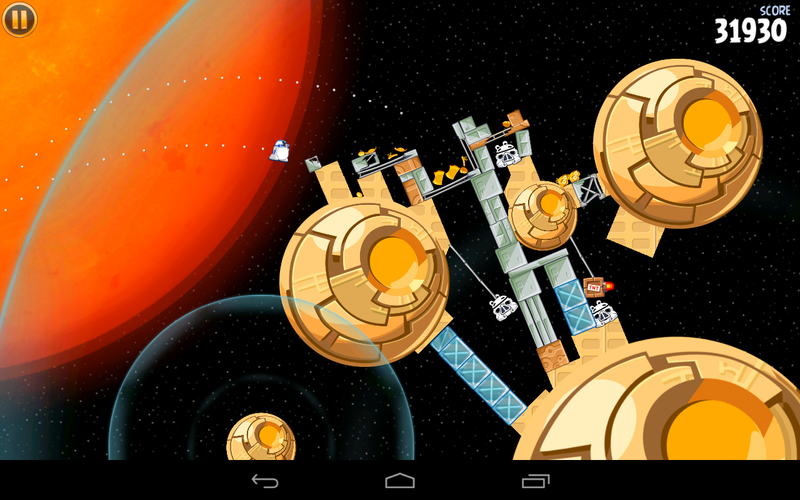 In Angry Birds Star Wars, the storyline is that of Episode 4: A New Hope. You start out on Tatooine, then on to the the Death Star and not a hint of the prequels. Future levels will pick up on the ice planet Hoth. Look, if you like Star Wars, you will like this. 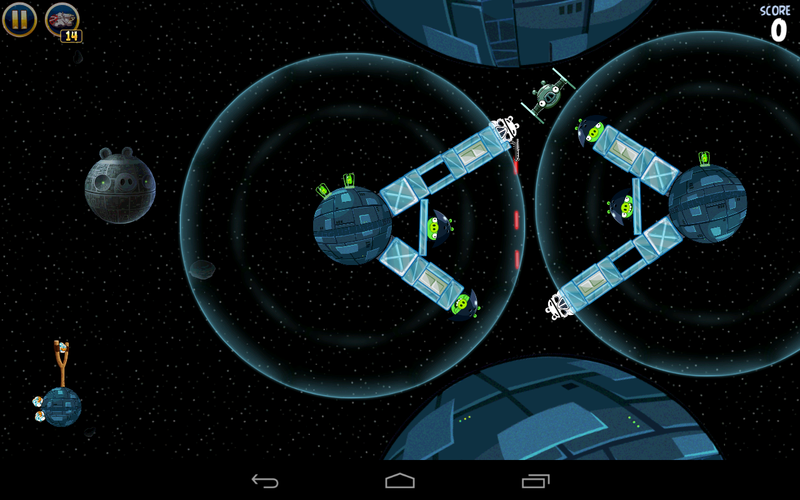 The graphics are as awesome as the other Angry Birds games. Everything is clean and free of aliasing. All the animations are smooth and I see no slowdowns. There is a very playful feel to the game, though. You will recognize iconic Star Wars objects built out of destructible objects. And pigs that look like Sand People, Storm Troopers, and TIE Fighters? Hilarious. There are two versions of this game, an HD edition and standard. The HD version is $2.99 and the other one is free, but you should just get the free one. There is almost no difference between the two, except there are some menu ads in the free version. You can even buy them out with an in-app purchase if you want, but I wouldn’t bother. I like that the more stars you get from completing levels, the more bonuses you get. There’s a cool Millennium Falcon super-weapon that you have limited use of, and R2 and C3PO make appearances too. The game just feels very well-designed, like all Angry Birds games. You have to make smart use of the bird powers to win the stages. There is no reason to skip this game -- get it now. Some games are expansive -- epic even, and require a serious time investment. Others are just fun. Pixel Twist is the latter. In this game, you have to rotate a seemingly random blob of floating pixels to reveal the image within. It’s a little like those magic eye images in that you think you’re just looking at noise, until suddenly the image is revealed. There are two game modes, both of which rely on the same basic gameplay mechanic. You start with a mass of pixels hanging in space. In the upper right corner is a thumbnail of what you’re looking for. Just touch and drag to rotate the pixel cloud in any direction. You have to watch carefully as shapes begin to coalesce and fill in the gaps. 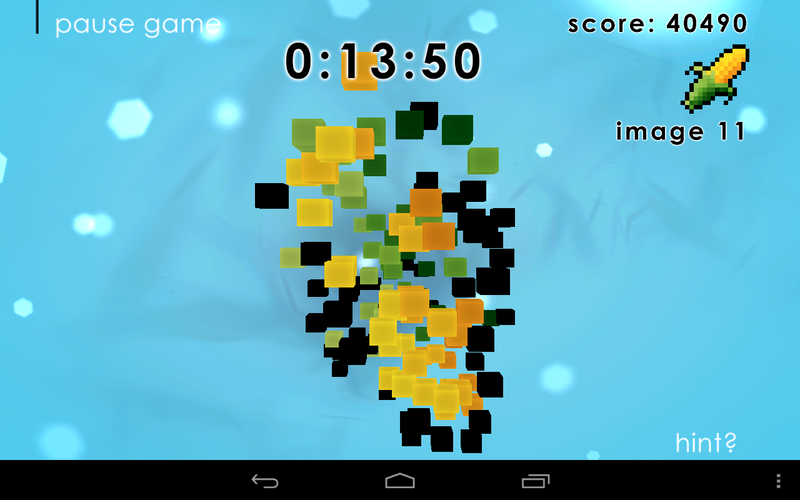 There is a regular game mode where you simply complete puzzles until you run out of time. You start with a minute and get a few extra seconds for each completed image. The other mode is a one minute speed run to complete 10 puzzles. There are over 90 cool little pixel-art images to work with. As you encounter them randomly, they show up in the gallery so you can check them out as often as you like. There isn’t much else to the game graphically, but it has a cool style. In general, Pixel Twist is light on features. 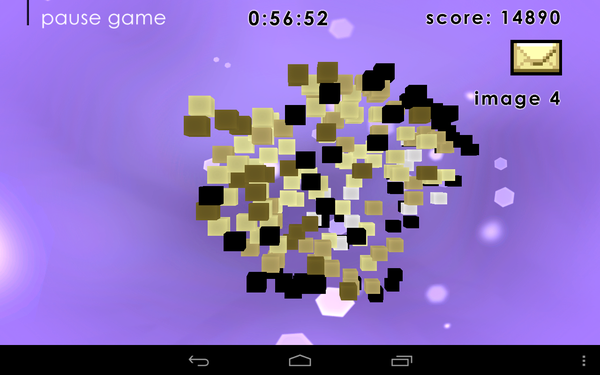 However, it’s great for killing a few minutes, and it is genuinely addictive. This title comes at no cost, and the ads only show up after you’ve finished a puzzle. You can buy out of them for $0.99, but I don’t think you need to worry about it. I'd definitely recommend you pick this game up for your phone or tablet. That's it for this week's roundup. Feel free to let me know about any apps you come across in the Play Store that are worthy of a mention here.